This is striking at first sight, and it will remain a problem as long as we won't become familiar with the very heart of this music: we'll have to listen to sentences paced by the tactus, instead of counting values fitting a regular time signature. then only, try to gradually move to older music. First, barlines don't help to read a piece in which musical ideas have various rythms and lengths, and, conversely, when reading a dance, one may think that barlines aren't indeed saying anything more than the music itself. But not everybody agrees on this point: Sybrand Bakker, already mentionned, thinks that barlines do bring structural information in dances published at the end of the 1600s. I haven't had a chance to submit him a few objections: first, it seems that this kind of dances appeared somewhat before these years; secondly, one has often to make a decision inside a measure - just think about hemioles occurring so often; and, last, strangely enough, I remember having read in Apel about pieces from the beginning of the 1600s, published later on in this century, with barlines added in a very weird way! 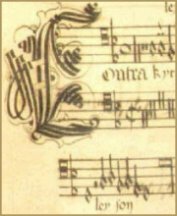 By the way, it's interesting to notice that barlines appeared around 1600, at the moment when music began to be published in vertical scores like it's the case nowadays. Formerly, pieces published for performance were layed out in separate parts, that is, one part after the other (the whole cantus part, then altus, etc): have a look at the facsimiles shown on this site. Meanwhile, for their personal usage, composers sometimes wrote their music in vertical scores, and this is quite understandable! First, when a note must go across a barline; thus we won't come upon such a situation, and that's a good point, since this notation artefact leads sometimes to write identical rhythmic patterns in different ways! Then, a tie is sometimes used to make reading easier, or to suggest some accent in time signatures involving dotted values. Last but not least, some values must be written with ties, by adding smaller values. And here we come to the very heart of our subject: since ties didn't exist in the renaissance, mensuration system wrote composite values in a different way. Nowadays all value ratios are binary: a whole note is equal to two half notes, each of them being equal to two quarter notes, and so on. Formerly some ratios were ternary, and this is more and more true when looking at older music, because these ternary ratios - which were said perfect - were the very foundation of the system. We use to think today, and there's some evidence for that, that this idea of perfection was first related to the ternary nature of God. Mensuration signs found at the beginning of each part told which notes were in ternary or in binary relationships. Mensurations weren't necessarly the same in each part, and they might change when a new sign was written further inside the staff. That's probably the most astounding feature of the system at first sight, but also the most specific and the most understandable one, if we remember the lack of ties. Since new values couldn't be built by adding smaller ones with ties, they were obtained by substraction: in a ternary mensuration, a long note may be made shorter by some smaller note standing on its right or left side! Though the mensuration sign first specifies that a perfect note weights three smaller ones, this long note may be imperfected by a neighbouring smaller note, and then weights only two of them; the total values still amount to three, and this is called a perfection. These basic principles will be better understood when we will have said enough to be able to give examples..
At first sight there's no tempo indication for any music of this time, but that's not true, because it was indeed included in mensuration signs, at least when considering their standard meaning at the very beginning of the system: several documents of this time show singers touching each other's shoulders with hands, in order to beat the tactus, which specifies that a semibreve (our whole note) should be played roughly as fast as human heart beat. This definition shouldn't be taken too strictly (we know that a performance might change according to the room size or other circumstances), but it's nevertheless an indication of tempo, for this is proven by the existence of proportion signs which specified that the music had to be sometimes played twice, third, ... as fast or as slow. Proportion signs are an extremely complex subject, because they were written with many different symbols, about the meaning of which theoreticians were fighting each other! For instance, the meaning of the symbol still in use today has changed in a rather obscure way, which hasn't been fully understood up to now, though it might have looked so simple at first sight... (this point is mentionned in a few words in Apel page 192, and widely investigated in Busse Berger). That's why we will study only basic mensuration signs: those specifying a performance according to the unitary tactus (integer valor), that is, at the approximative tempo of a semibreve per human heart beat. To avoid any misunderstanding, let's add that a tactus or battuta is made of a downbeat and an upbeat on every semibreve. It's obvious indeed: how could we have several downbeats without any upbeat in between? We will start from a facsimile like those available on the site, and we'll get its transcription into modern notation, and then we'll even be able to listen to it: if you haven't did it yet, please go and listen to my transcriptions of Josquin, Barbireau, Mouton, etc, on the page dedicated to pieces from the renaissance, I guess this will give you some reason to read the following lines! Of what steps will be this process made of? First be careful to chose an easily readable facsimile. It's more important than you might think at first sight, since my experience has been that the bad condition of a document may lead to more problems than the transcription rules themselves: some continuation signs may refer to various places on the sheet, some notes have been emendated, some note stems are hardly visible, some rests may look like points - or conversely - all these problems can be real traps for the beginner that we still are at the present time! Then, you'll have to change ligatures on the manuscrit into separate note symbols, like those we write today. I think this is a simple and pleasant process, which is explained on my page about ligatures. Having done so, you'll get a sequence of notes, but you won't know yet their value ratios, which are specified by mensuration, our present subject. Thus, the last step will be to read the mensuration signs, in order to know the transcription rules toward modern notation. I'd advise you to begin with a piece written in binary mensuration, that you'll read quite easily: it's a good idea to practice each new point after the other, rather than trying to deal with all of them simultaniously. One can see that our modern rests nearly look like former ones, with a striking exception: today a whole note rest is said to hold for the whole measure - whatever the time signature might be, while other rests have all the same duration as the corresponding note. The various symbols for maxima and longua rests will be explained later on. Now, a few words about a practice quite usual amongst many editors: dividing note values. If you don't, it means that you'll transcribe a semiminim by a quarter note, a minim by a half note, then, according to mensuration, a semibreve by a dotted or undotted whole note, a breve by a dotted or undotted square note, a longua by two or three tied square notes, and a maxima, which is nearly always binary, by four tied square notes! Shall we preserve this 1:1 ratio in the transcription? I'd answer yes, every time we don't get a cumbersome modern transcription, that is, in all cases but those which involve a part written in very long values from its beginning to its end, like would be the case of a cantus firmus, for instance. In this latter case, and only then, we'll have to divide all values by four, for instance, and thus transcribe maximas by square notes, ternary or binary longuas by dotted or undotted whole notes, etc, and semiminims by semiquavers. That's a pleasant example of getting something positive from a cultural gap: obviously, any renaissance amateur having the same problem as mine would have been frightened by semiminims like I'm by semiquavers! I'm happy to give you now good news, rather than bad ones: indeed, only two levels of division are really relevant in most cases, and they are: how many semibreves (whole notes) in a breve (square note), and how many minims (half notes) in a semibreve. At lower levels, the ratio is always binary, like it is nowadays: a minim is equal to two semiminims (quarter notes), a semiminim to two fusas (quavers), and a fusa to two semifusas (semiquavers). Higher levels, maxima => longuas => breves, are not so often relevant: they're binary in the absence of a different indication, and thus we'll tell about them later on. Division of breves into semibreves is called tempus. When ternary, this division is called tempus perfectum, when binary it is called tempus imperfectum. Ternary division of semibreves to minims is called prolatio major, and binary division is called prolatio minor. Don't get confused because of these different names: major and minor are indeed the perfect and imperfect instances of the division prolatio. In real musical life, we'll always need to specify the nature of both levels of division, thus we'll have to deal with four possible combinations: perfect time - major prolation, perfect time - minor prolation, imperfect time - major prolation, and imperfect time - minor prolation. Besides that, the history of the system and the design of mensuration signs would suggest to study first the perfect ternary mensurations. and then only, we'll look whether this similarity remains true in every detail, and whether dealing with two levels of division at the same time leads to remarkable interactions. Now it's time to give the mensuration rules, that you'll find on the next page.